With age-appropriate leads, spirited direction, and a bit more humor than we’re used to in “Romeo And Juliet,” St. Louis Shakespeare delivers a good, solid production of the story of the star-crossed lovers and the family feud surrounding them. As in any production of this Shakespeare tragedy, the second act seems to overstay its welcome, but the most admirable cast and some more light touches of humor help us get through it all until the final, inevitable outcome. 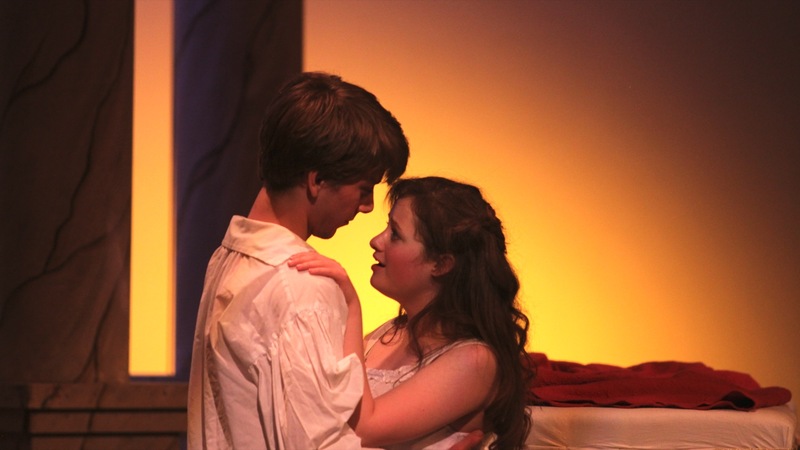 Young lovers Romeo, played with a confident swagger by Leo Ramsey and Juliet, with a sweet innocence portrayed by Emily Jackoway, are closer to the real ages as described in the script and they both handle the difficult roles with aplomb. The balcony scene, in particular becomes a bit more frivolous but closer to the reality you’d expect from two such eager young lovers with hormones running wild and the unmistakeable pain in the need to part from each other- even for a moment. 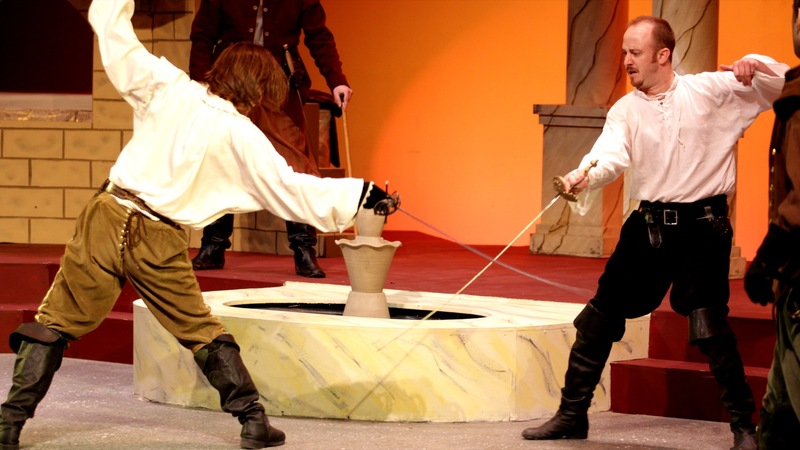 Brian Kappler and Andrew J. Weber team up for playful fun with their friend, Romeo and Charlie Barron is wonderful as the trustworthy Mercutio. Also turning in a solid performance is Roger Erb as Tybalt from the House of Capulet who, like Mercutio, meets an early end as Act I comes to a close. Jamie Eros is perfect as the caring but stern Nurse who tries to guide Juliet through the complications of young infatuation. Brian J. Rolf and Christi Mitchel as Lord and Lady Capulet and Chuck Winning and Cindy Lewis as the Montague’s all deliver the goods as the heads of the feuding households. Paul Devine, despite more than a few fumbles with lines on opening night, is a good Friar Lawrence. He mixes wit and wisdom in equal doses in dealing with the headstrong young Romeo. Paul Edwards gives us a strange but somehow effective portrayal of young Paris showing perhaps a bit too much of his feminine side. As a prospective suitor for Juliet, he does not exactly impress the young princess as does the bravado and passion of young Romeo. The rest of the ensemble also does fine work in keeping with the feel and tenor of the period. Director Suki Peters does a masterful job of controlling the core of the tragedy while bringing us a more light-hearted and down to earth portrayal of the folks in fair Verona. It’s a spirited production that wins us over even as we await the tragedies that befall so many members of both sides of the families-particularly in the surprise outcome of the fight between Romeo and Tybalt. Assistant Director and Fight Choreographer Brian Peters does a stunning job as well- bringing the strength and tension of the various bouts of swordplay encompassing the entire stage and making it all very realistic. Add to that the contribution of Jamie Eros as choreographer. Kudos as well to the technical crew including Chuck Winning’s handsome set design with the fountain at center stage which comes in play at the end of Act I in particular and then becomes the burial pyre for the second act. Lighting designer Jaime Zayas also does a fine job including occasional projections to help set the locations and a very fine sound design from Josh Cook. It’s all over too soon, however as this will be the final week-end of “Romeo And Juliet” for St. Louis Shakespeare. The final performance will be on Sunday, April 6th. Contact St. Louis Shakespeare at 314-361-5664 for tickets or more information. This entry was posted on April 2, 2014 at 9:43 pm04 and is filed under Uncategorized. You can follow any responses to this entry through the RSS 2.0 feed. You can leave a response, or trackback from your own site.